The name of the Gaon of Vilna conjures up an almost mythical figure of brilliance and saintliness. After Maimonides, it is Rabbi Elijah ben Solomon of Vilna (1720–1797) who epitomizes the highest achievements in learning and piety in post-Talmudic rabbinic Judaism. A man of great fame in his own life time, he left few manuscripts behind. Shortly after his death, writings attributed to him began to circulate. The rabbinic court of Vilna found it necessary to issue a statement declaring that any work that was to be published under the name of the Gaon had to be authenticated by the court. Indeed, today only four manuscripts are known as being genuinely in the hand of the Gaon. The work displayed here is one of them. Two other leaves are treasures of the National Library in Jerusalem; a third is reproduced in a biography of Rabbi Elijah. 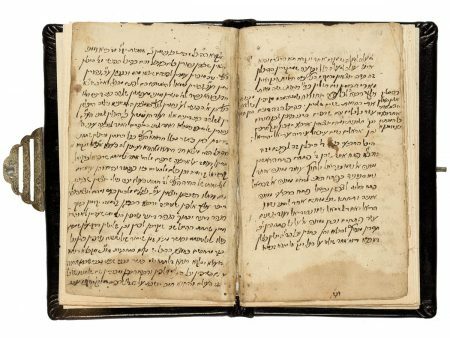 In addition, his autograph notes appear throughout a printed edition of the Palestinian Talmud, Seder Zera’im, Amsterdam, 1701. Avivi 1993, pp. 12–13, 19; Etkes 2002; Jerusalem Talmud 2007; Landau 1978, pp. 410–415; Printing the Talmud 2005, pp. 274–277; Sefer Yahel Or 1882, pp. 72–74; Selected Manuscripts 1985, p. 27, no. 53b.